This raw banana curry (or green plantain curry if using plantains also known as cooking bananas) using raw green bananas or green plantains uses coconut, spices and green mung beans (also known as cherupayar or pachai payar in South India) which makes a very easy and yummy curry with rice for lunch or dinner. You can quickly prepare this raw banana curry in a pressure cooker which helps you to make a quick and easy vegetarian curry for lunch or dinner using any leftover raw green bananas or plantains, coconut and few spices. We can use raw green plantains or medium to large sized raw green bananas to make this raw banana curry with payar (mung beans). If you do not have freshly grated coconut, you can also use frozen shredded coconut or dry shredded coconut or dessicated coconut to prepare this banana curry. Adding ghee in this recipe is totally optional, but I have found that adding ghee adds so much flavor to this curry, so I recommend adding ghee to this raw banana curry with green mung beans. Also you may slightly adjust the spices and see how you like it. 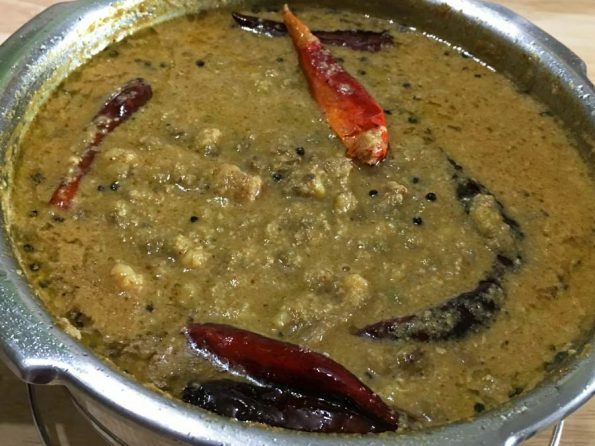 So here is how you can make this easy and quick South Indian Kerala style ethakka curry or kaya curry or vazhakkai curry with payar following this raw banana curry/green plantain curry recipe with green mung beans. 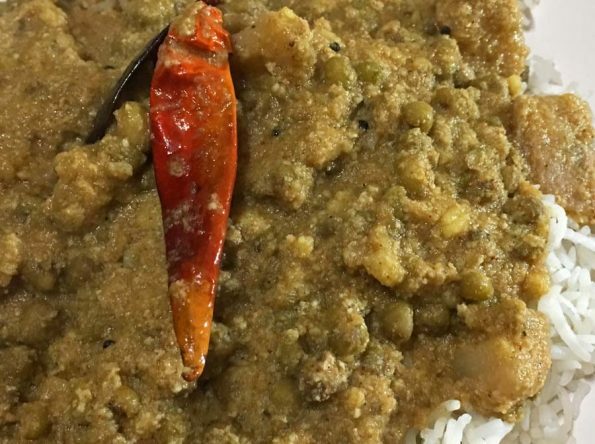 You can buy green mung beans here and dry unsweetened shredded coconut here (if you don’t have freshly grated coconut) to prepare this raw banana curry. 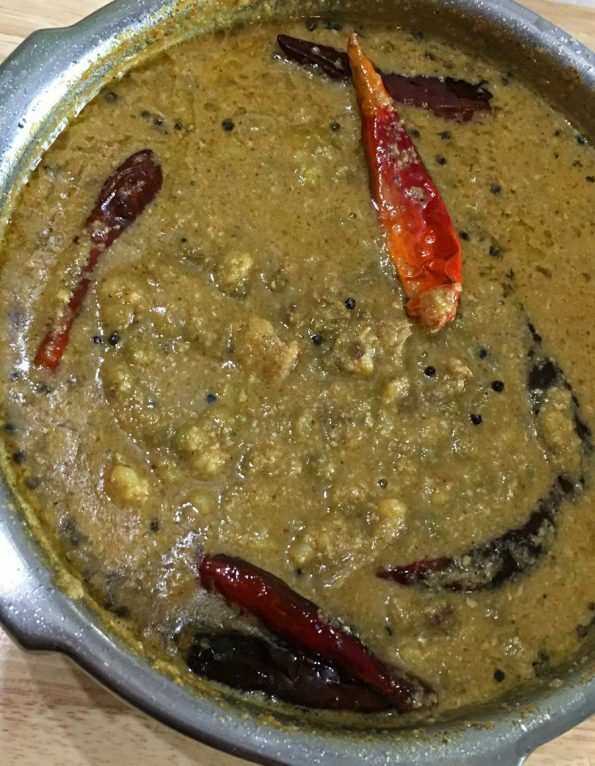 Raw banana curry with cherupayar(green mug beans), coconut and spices makes a very easy, quick and yummy vegetarian curry with rice for lunch or dinner. Wash and peel the green banana or green plantains, chop the plantain in to small cubes. Transfer the sliced green bananas to the pressure cooker. Wash the green mug beans very well and add this also to the pressure cooker. Add the water, salt and mix everything well. 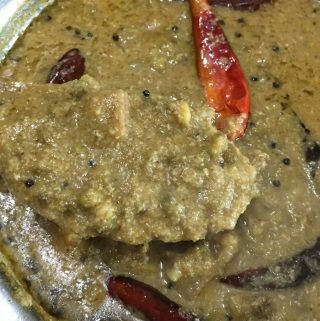 Also add the crushed garlic, turmeric powder, red chili powder, 2 green chilies, coriander powder and also ghee, mix everything well and close the pressure cooker with lid. Cook the contents for about 2 to 3 whistles or for about 10 to 12 minutes of cooking time. Once the cooking is done, switch off the pressure cooker and wait for the cooker to cool down. Meanwhile grind the coconut, cumin seeds and one green chili really well. Keep this grind coconut mixture aside. 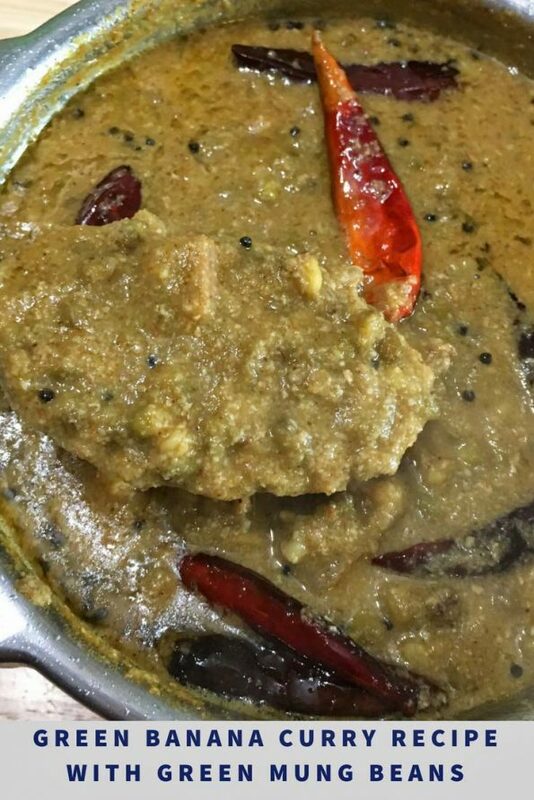 Once the pressure cooker is cooled, open the cooker and see if the green mung beans (cherupayar) and ethakka (green plantain banana) is cooked well and soft. Stir the contents well and add the grind coconut mixture to the pressure cooker, stir everything well again. Check the salt and add more if needed, also add more water as needed for the gravy, and stir well to mix the contents. Heat the contents in medium heat for another 2 to 3 minutes, stirring occasionally so that the coconut mixture will blend nicely with the cooked plantains and mung beans. Once the cooking is done, switch off the stove and let us make the seasoning for the curry. To make the seasoning, heat the oil in a small pan, and when the oil is hot, add the mustard seeds. 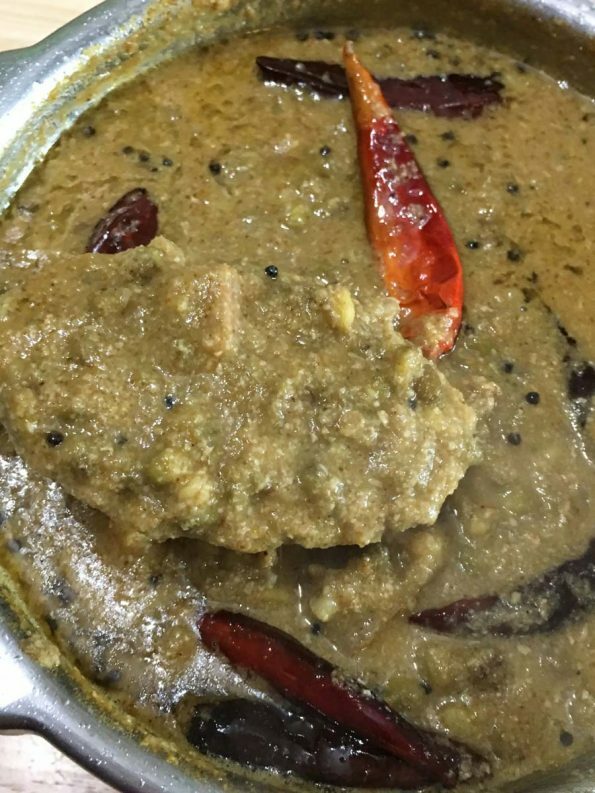 When the mustard seeds splutter, add the red chilies and curry leaves, fry for a few seconds. Pour the prepared seasoning over the curry, gently mix in. Serve the easy and delicious mung bean plantain curry with rice and other side dishes for an easy, yummy Kerala style lunch or dinner. 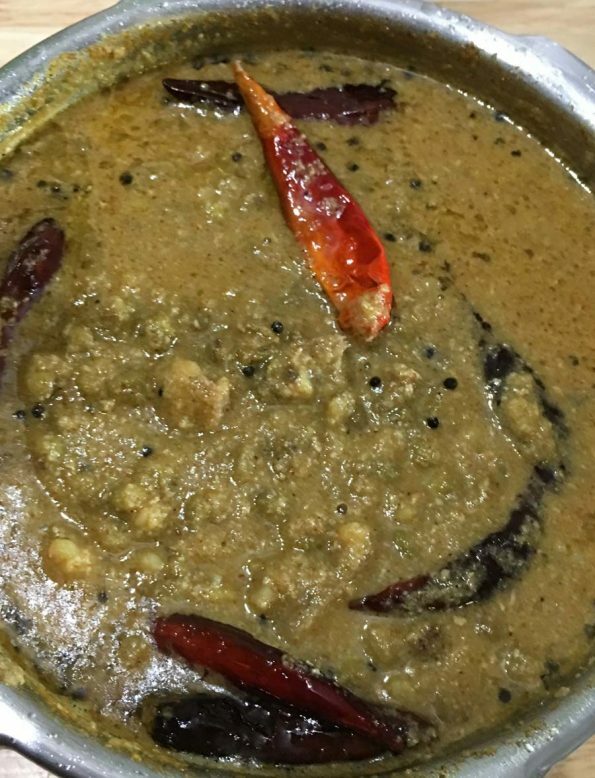 Hope you found this post on ethakka curry with cherupayar or green banana curry with green mung beans, coconut and spices helpful in making an easy, yummy curry for a vegetarian South Indian Kerala style lunch or dinner.